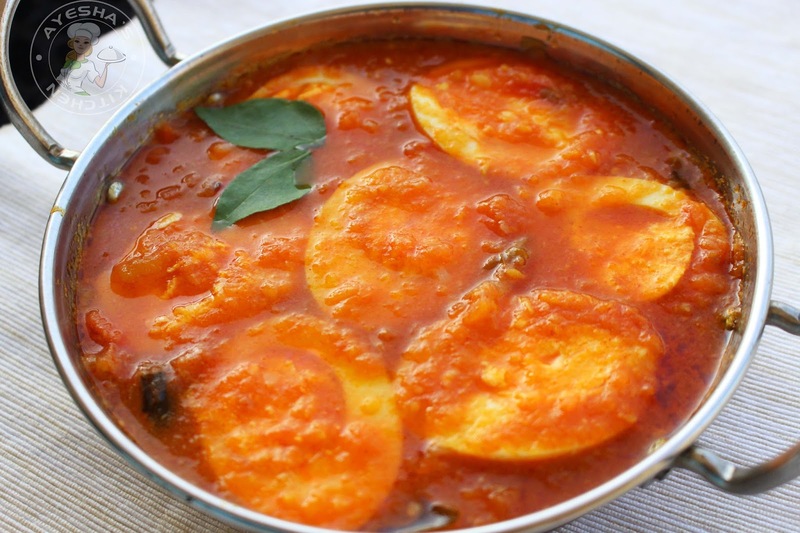 There are lots of varieties in Indian egg curry recipes and each tastes different. Breakfast recipes with eggs are very healthy and easy in this busy routine. Some egg recipes for breakfast like egg roast, egg coconut curry, egg butter masala is time consuming but is worth trying. But this version is Quick and heavenly delicious curry recipe. Try this simple spicy egg tomato curry along with your breakfast Dosa / chapati / puri etc. 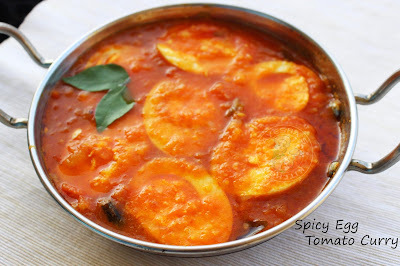 Here is the recipe for a spicy tangy easy breakfast eggs / Indian egg recipes / Egg recipes Indian . Enjoy. Boil the eggs with enough water for 10 minutes. Transfer it to cold water and then peel the eggs. You can add half teaspoon of baking powder while boiling eggs which helps to peel the hard boiled eggs easily. This is optional only. Set aside. Heat a pan with oil . Add the ginger garlic paste, green chilies and curry leaves. Saute for few minutes over a low flame. To this, add onion paste and saute well until raw smell disappears. When done, add chili powder, turmeric powder and mix well. Cook for a while and then add the chopped tomatoes along with salt. Give a fine mix. Close the lid and let it cook for 2 minutes. Now open the lid, Stir well with a spatula. You can see the tomatoes mushy enough. To this, pour half a cup of warm water and cook over a medium flame until the oil floats on the top. Add water as per the consistency you need. Finally, add the hard boiled eggs (cut into halves) and mix well. Serve hot with Chapati, paratha, puri, rice etc..